Eucalyptus Essential Oil. A Versatile Aromatherapy Oil For Health. Use energising eucalyptus essential oil if you are feeling tired, run down or are prone to colds. It is best known for its fighting power against chesty coughs and colds and it has probably been used to rub many a chest over the years! It helps to clear the mind and focus concentration. It feels cool to the skin and yet warms the muscles. Eucalyptus was a traditional remedy of the Australian aborigines, used for healing wounds, reducing fever and combating infections. They also used to burn leaves for fumigation. There are over 300 varieties of Eucalyptus with around 15 that give a valuable essential oil. They are one of the tallest trees in the world growing as high as 480 feet. Eucalyptus globulus, Eucalyptus citriadora, Eucalyptus radiata and others. Australia, Spain, Portugal, USA, China, Brazil, Southern Africa. Penetrating, fresh, balsamic and camphorous. Eucalyptus essential oil is excellent for treating all types of fever. It has a profound cooling effect on the body and so lowers temperatures. Use as a steam inhalation for a natural decongestant treatment for colds and catarrah - it eases nasal congestion, but can also help halt the cold virus. Use eucalyptus in airsprays as protection against flu and infectious illnesses. Its antiseptic and healing properties is helpful for cuts, wounds and burns - use in a solution. Urinary infections, such as cystitus, respond well to this oil. It has a diuretic action which also makes it useful. Eucalyptus essential oil can be used in aromatherapy massage to relieve aching muscles and rheumatic pain. It is a great insect repellant - blend with lavender or bergamot and use as a room spray or mix with a carrier oil to use on yourself. This is a very powerful oil and so should be used with care. Do not use on babies or small children. Eucalyptus (like lavender) has the ability to increase the effects of other essential oils with which it is blended. It is a natural and harmless, but effective way of removing tar from your clothes or skin! Its nature is to restore psychic equilibrium. Eucalyptus globulus (the 'blue-gum') is the most widely used variety, but some believe that Eucalyptus radiata is a better choice for aromatherapy - it has all the properties but a more pleasant aroma and is less likely to irritate the skin. 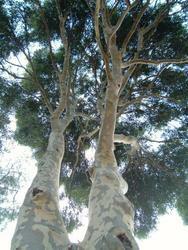 Eucalyptus citriodora (smells of lemons) is also considered to be valuable.